“I am a golfer who loves wine” is how Charles Mélia, founder of Domaine du Val d’Argan, situated some 20 odd kilometres from the beautiful Moroccan coastal town of Essaouira, introduced himself to me. 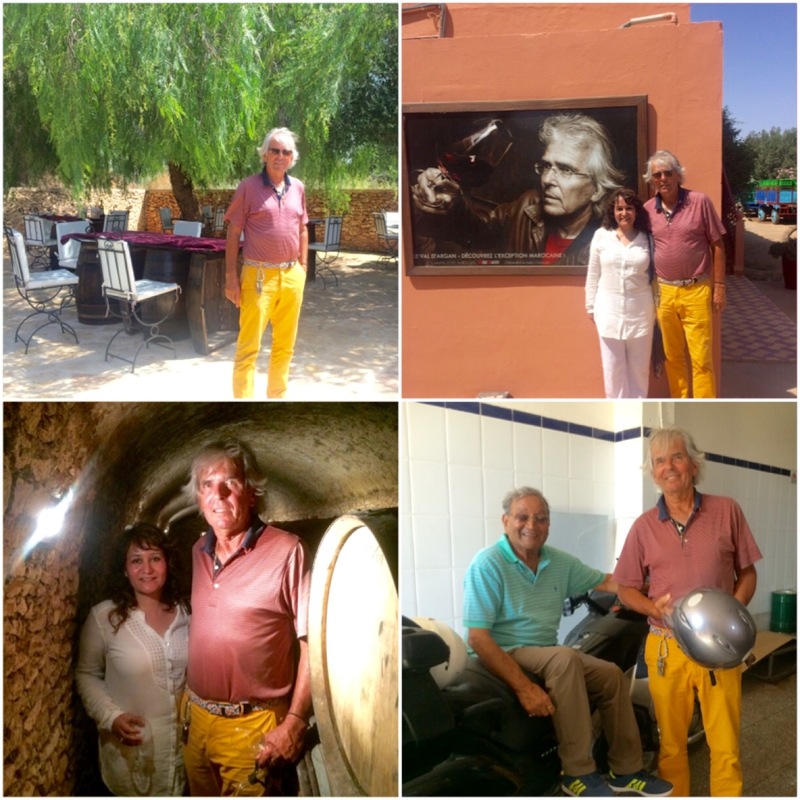 However it was not golf but his passion for wine which brought this adventurous Frenchman to Morocco, thousands of miles away from his home in Châteauneuf-du-Pape, where his family owns a vineyard Château de la Font Du Loup. It was quite by chance that I found out about Le Val D’Argan while sipping on some Moroccan tea at Café des Epices, close to Jemaa el Fna, the main market square in Marrakech. 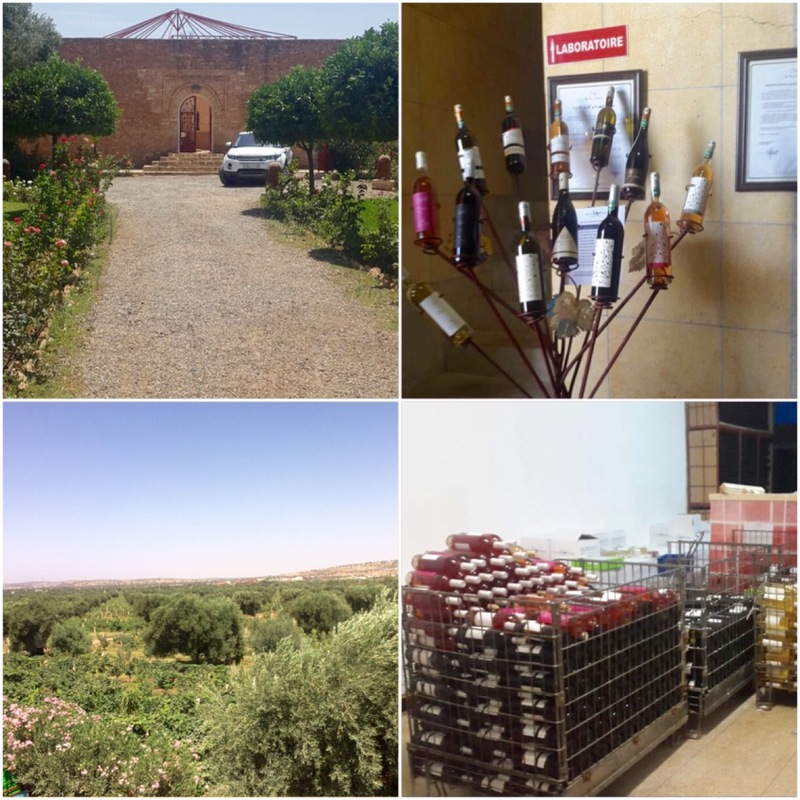 When I told the manager Omar Lyazidi that my food and wine trails had brought me to Morocco, he insisted I stop at Val d’Argan, on my way to Essaouira. I am so glad I listened to him as the few hours that I spent at this boutique winery were some of my most memorable moments in Morocco. Not to mention the wines which were just superb, including an organic “gray wine” Perle Grise de Mogador which was not grey but pale pink in color. 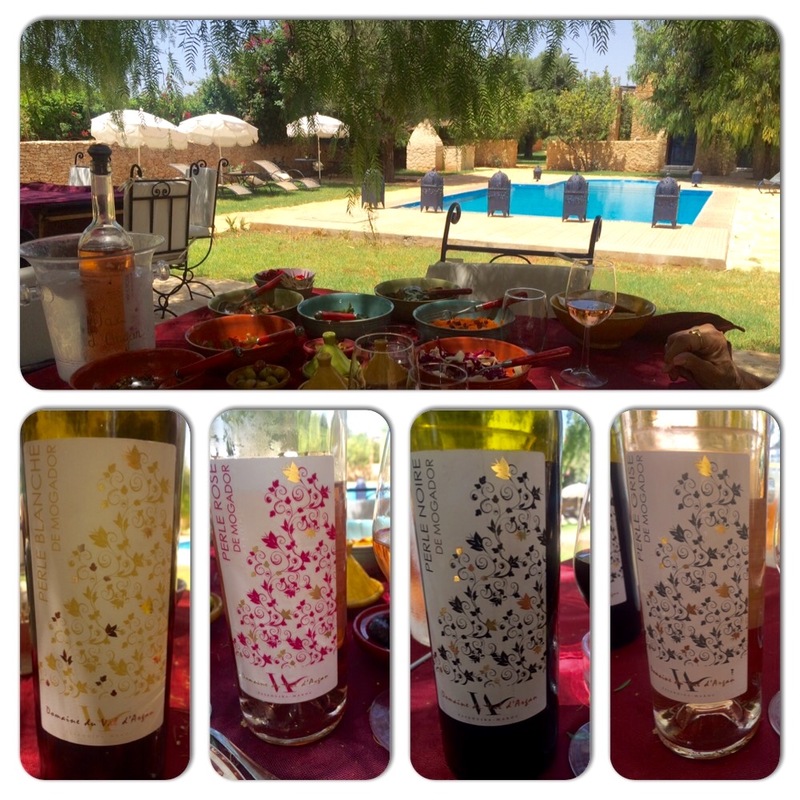 Sitting at the outdoor summer restaurant next to the swimming pool around which was a guest house with three rooms, each with a different colour scheme, I was finding it difficult to believe that I was in Morocco and not some vineyard in the South of France. Copious amounts of wine was being poured in our glasses as my father and I settled for the degustation four course menu paired with four wines. The rosé was so delicate, fruity and fresh that I could have easily finished a bottle by myself. Hundreds of questions were running through my head like how did this Frenchman manage to grow vines in a semi-arid desert like terroir where summer temperatures could reach as high as 45 degree centigrade. What were the varietals which found best expression in this region? Luckily for me all these were answered by the vigneron himself who joined us for the last course. Charles Mélia, a Frenchman who spent the first twenty years of his life in North Africa, founded Les Domaines du Val D’Argan in 1994 in a virgin territory where no one could ever think of growing vine. He had to literally begin from scratch including getting electricity & water connections for his property. It took him four years to build the winery, cellar, restaurant and guest house. Even now it is work in progress as he is constructing a new cellar and expanding the winter restaurant on the first floor above the winery. This one has panoramic views of the vineyard, olive and argan trees. The grapes that Charles decided to plant were the Rhone valley varietals that he was familiar with; Ugni Blanc, Grenache Blanc, Clairette, Roussane, Viognier, Bourboulenc & Muscat de Beaumes for the whites and for the rose & red it was Mourvèdre, Syrah, Grenache and Marselan. In reply to my query about sunburn affecting his crop he explained how the cooling winds from the Atlantic took care of the high temperatures. He also used efficient canopy management techniques (sorghum crop cover) to protect his grapes from heat stress. While taking a stroll around the vineyard I could feel those gentle pleasing winds. Incidentally Val D’Argan is the first vineyard in Morocco to obtain organic certification. The one varietal that Charles Mèlia loves working with and which he feels has the greatest potential is Marselan, a cross between Grenache and Cabernet Sauvignon used in AOC Côtes du Rhone appellation mostly for blends. It is a red wine grape known for its highly tannic nature and Charles finds it very challenging as a wine maker to tame the tannins and produce a mono-varietal wine. I tasted a sample from the barrel and found it to be complex yet harmonious. In fact most of the wines of Domaine du Val D’Argan are well structured with minimal oak. Charles Mélia likes to keep it simple and in harmony with nature . He uses bio-dynamic techniques and very little manipulation. He also has a small barrel cellar where he loves to experiment with several varietals including a late harvest Viognier. Walking around the winery with Charles hearing him belt out orders in fluent Arabic to his workers, I could not help but admire this Frenchman who has achieved the impossible task of producing fine French wine in African desert. I found his wines had elegance and restraint. There is no way you should miss out a chance to try them out on your visit to Morocco. It is easy to reach Val D’Argan which lies just two hours west of Marrakesh in Ounagha, only 20 minutes away from the historic coastal town of Essaouira. Perfect for wine tourism, it offers rooms, a restaurant which serves delicious food paired with wine and a tour of the winery, cellars and vineyard. The main labels of the domaine are Gazelle of Mogador, El Mogador, The Val d’Argan, and Orients of Val d’Argan. These can be found at most prestigious restaurants of Morocco including Heure Bleue Palais at Essaouria.